What Causes Insulin to Spike With Milk Products? Insulin is a hormone used by your body to facilitate the transport of glucose into your body's cells for use as energy. An insulin spike results in a rapid increase and fall of insulin levels in your body. While an insulin spike can produce a quick burst of energy, insulin spikes do not benefit sustained endurance. Carbohydrates in general, and simple sugars specifically, can produce insulin spikes. The simple sugar lactose, present in milk, can cause insulin spikes, but to a lesser extent than glucose. Lactose is the sugar present in milk. Lactose is a simple sugar composed of glucose and galactose. This composition results in lactose's ability to produce insulin spikes. Before your body can produce an insulin spike from lactose, your body must beak down lactose into its simplest components. Some athletes use milk products to produce insulin spikes. However, this can cause problems in individuals who have a lactose intolerance. Milk is an insulinogenic, meaning that milk promotes the release of insulin. This insulinogenic property is mainly due to milk's sugar content. However, whey protein can also play a role by releasing insulin, but to a lesser extent. Additionally, hormones injected into cattle to increase production could further increase milk's insulinogenic properties. However, clinical research has not confirmed how hormones affect the insulinogenic properties of milk. Cream and butter do not raise levels of insulin as much as yogurt, cottage cheese and any milk product with casein or whey. Therefore, the amino acid content of milk may also hold responsibility for the insulin spikes. The amino acids leucine, valine, lysine, and isoleucine are insulinogenic. These are the amino acids present in whey in the highest concentrations. This could explain why whey protein elicits a more significant insulin response than other milk products. Athletes trying to build up muscle and lose fat must take care to time the intake of milk products. Milk products will only benefit you if consumed at the proper time in relation to your workout. 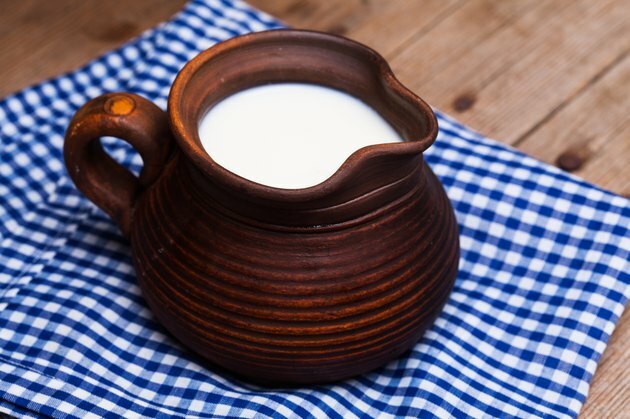 Therefore, you should consume milk products when your body is more likely to use the milk product as energy and not convert the milk product into fat. This means that breakfast, mid-mornings and immediately before or after your workouts are the best times to consume milk products. Can Drinking Milk Before a Workout Make You Sick? What Effects Does Lactose Have on the Human Body? How Does the Body Metabolize Lactose?